Tomoyasu Hotei (pronounced ‘hoe-tay’) was just 14 years old when he walked into his local music store in Takasaki, Japan and had something of an epiphany. There he stood, transfixed by a poster of T. Rex legend Marc Bolan: an almost god-like presence caught in a moment of ethereal majesty. Time ground to a halt. 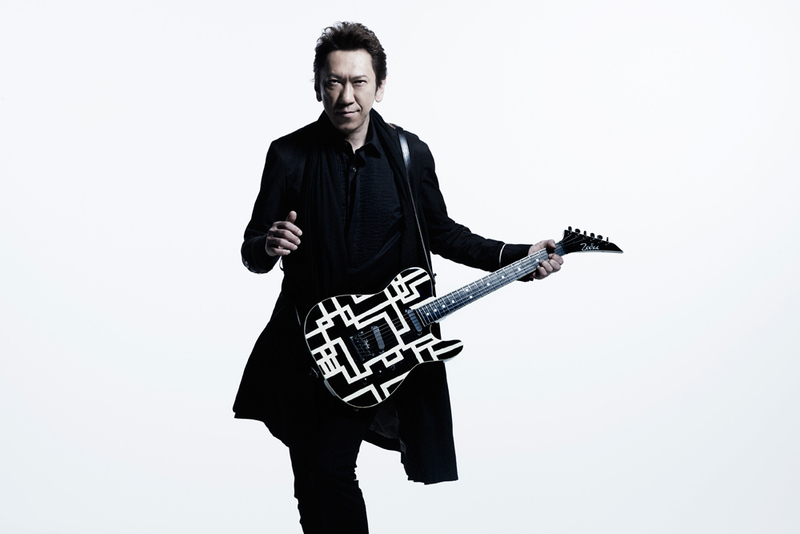 Flash forward nearly 40 years, and Japanese guitar legend Tomoyasu Hotei has been a Londoner for three years. Much has happened over the decades, from young stardom in Boøwy (who led the charge of Japan’s band revolution in the late ’80s and became the first male artists to top the album charts three times in one year), to writing music used in some of Hollywood’s most revered cult classics. He’s been invited to perform on stage with some of his biggest idols, including David Bowie and The Rolling Stones, and he’s worked with film score king Michael Kamen, who Pink Floyd consulted as orchestral arranger for The Wall. Released in October 2015 via Spinefarm Records/Universal, Strangers is an album full of surprises. Instrumental opener ‘Medusa’ sets the tone perfectly, a magic carpet ride through a desert plain of dusty guitars and classical harmonies, brimming with Eastern curiosity and wonderment. If lead single ‘How The Cookie Crumbles’ – one of two tracks featuring punk visionary Iggy Pop – promised anything, it was that Hotei’s unique cultural perspective remains one that transcends and eclipses the confines of genre. And that’s exactly what Strangers does. After the heavyweight industrial synths of ‘Move It’ (co-starring Rammstein axeman Richard Z. Kruspe, also the man behind Emigrate), Hotei ropes in old friend and collaborator Noko of Apollo 440 for ‘Barrel Of My Own Gun’ – a dub-driven discourse through the ricocheting rhythms of quintessentially British trip-hop. It doesn’t end there, either. The brooding tensions of ‘Kill To Love You’ are catapulted even further by the distinctive voice of Bullet For My Valentine frontman / guitarist Matt Tuck, making it one of the finest metal ballads you’ll hear this year. American singer Shea Seger brings a female dimension to proceedings as she features on the sinuously glossy punchy rock anthem that is ‘Kill Or Kiss’ and again on forthcoming single ‘Texas Groove’, where Hotei ushers in a moment to bastardise the blues and reanimate something pure and human with the heart of a robot. ‘Texas Groove’ reveals a stomping electro pulse beating away beneath southern boogie and Shea’s smoky Texan vocals. Instrumental tracks such as ‘Into The Light’, ‘Departure’ and the title track itself are equally as staggering, in which Hotei recreates vocal melodies with soaring guitar motifs that showcase not only his overwhelming command over the instrument, but also an incredibly evolved ear for sound design and song craftsmanship. In that sense, there’s very little that Strangers doesn’t do. An album bold in ambition and even more so in execution, it would be fair to say that Hotei’s inaugural release for the international market is one that looks set to see him take the acclaim and status from his native country to the wider world. “Iggy is one of my idols, I’m very lucky to have a legend like him sing on two tracks,” enthuses the guitarist. “This was my first time working with British producers, before that I was used to just producing myself. They taught me a lot and expanded my views. As much as I’m a guitar player, I try to focus more on the overall sound. It was really important for this record to feel modern, I wanted to create a new style of guitar music. For example, ‘Texas Groove’ has a huge ZZ Top and Jeff Beck influence, but I wanted to take that and use it in a more unusual, electronic context and arrangement. “I think it’s hard to describe how my career has panned out,” Hotei contemplates. “I remember my first gig was to about 15 people! Certainly I’ve been lucky, but another word I would also use to describe my career is confidence. When I originally wrote ‘Battle Without Honor or Humanity’ for a Japanese gangster film, nobody was interested. I understand it isn’t your typical guitarist’s job, but acting and writing music in the movie industry really taught me things – it was like jamming with a different band. Then Tarantino saw the film and contacted me about using ‘Battle’, which got me a lot of exposure outside of Japan. Now I want to reach people’s hearts because I enjoy doing that as much as the challenge it presents. A lot of why ‘Strangers’ feels so different is because I’m halfway around the world writing and playing to new audiences… I’m not Hotei from Japan, in Japan, anymore. And here he is. Something tells us he’s only just getting started.